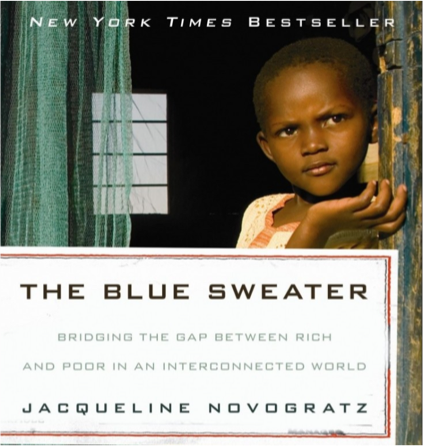 The founder of non-profit venture capital fund, Jacqueline Novogratz, is the author of “The Blue Sweater: Bridging the Gap Between Rich and Poor in an Interconnected World.” In the book, she describes a blue sweater, donning “zebras in the foreground and Mt. Kilimanjaro right across the chest,” that she wore often as a child. Like many of our own childhood artifacts, the sweater was donated to good will once she started high school. “Fast forward 10 years, about 5000 miles. I had left my career on Wall Street and was working in Kigali, Rwanda with a small group of women to start the countries first micro-finance bank to make small loans to poor women. When I was jogging through the streets, and low and behold 10 yards in front of me I see a little boy, pip squeak, knobby knees, wearing my sweater. So, I run up to the child, grab him by the color, turn it over and there is my name,” said Novogratz. Novagratz’s sweater is one article of clothing among millions that are circulating the globe as part of the second hand clothing trade (SHCT). Although the SHCT accounts for approximately 0.5% of global trade in clothing, more than 30% of those imports went to Sub-Saharan Africa (SSA) as early as 2005. Figures provided by an Oxfam report indicate that used garments, initially collected and sold by western charities, account for nearly 50% of the clothing sector in SSA. The SHCT is a billion dollar industry that spans the globe. 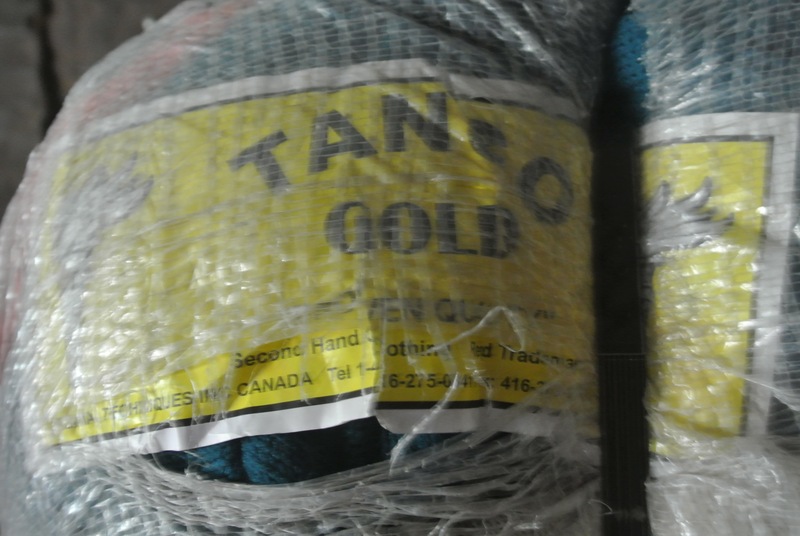 According to a CNN report, “whilst exact continent-wide figures are hard to come by, global used clothing exports from OECD countries stood at $1.9 billion in 2009, according to 2011 U.N. Comtrade data.” An estimate in the same article approximates import activity to be worth $3 billion, and the subsequent retail transactions to be worth two-times that amount. 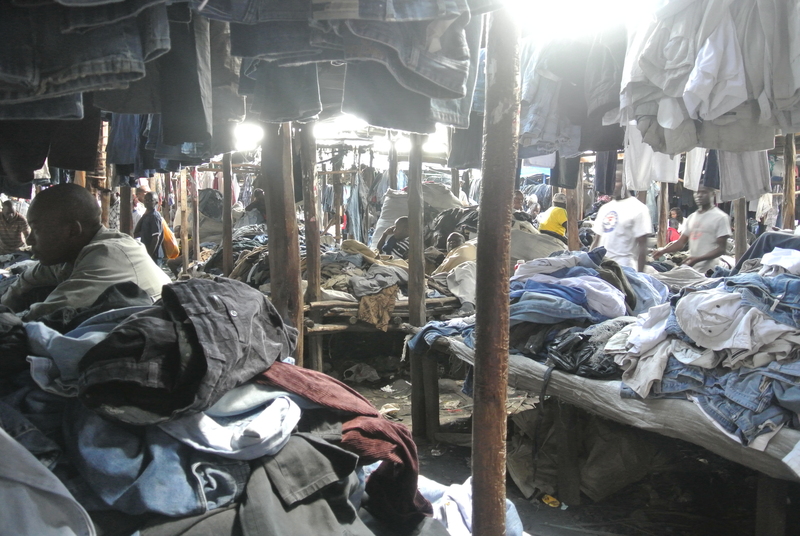 In Kenya the second hand clothing trade is known as mitumba. Used clothing was first imported as duty free charity in response to regional conflicts during the 70s and 80s. 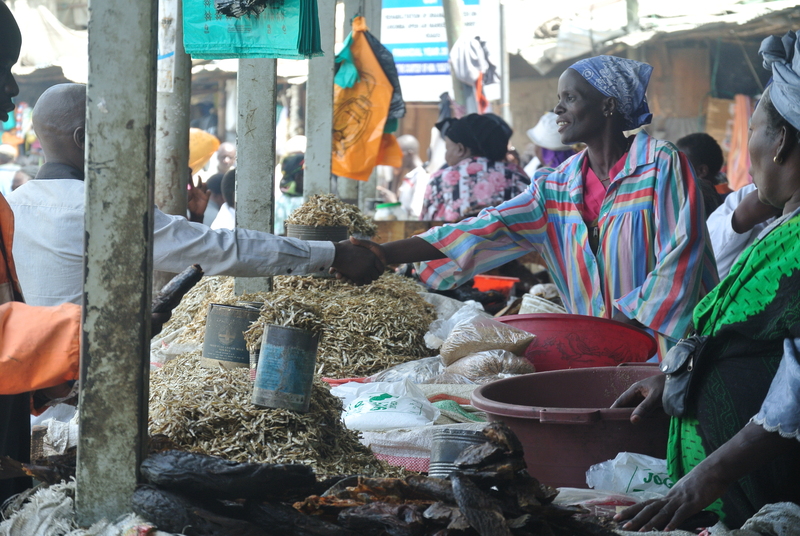 The trade evolved into a commercialized business sector in the early 90s, when market liberalization policies were introduced into the Kenyan economy. Those policies allowed for the importation of goods, like mass shipments of used clothing, at reduced costs. Indigenous textile industries across many African economies could not compete with the lower cost and higher quality of used clothing from abroad. In Kenya specifically, the resulting competition coupled with other factors like the collapse of the Kenyan cotton board, a drought from 1995-1997, lack of locally produced synthetic material and newly arriving cheap Asian imports, led to the closing of Kisumu Cotton Mills, Allied Industries Limited and Heritage Woolen Mills. However, before you mourn the loss of local textile production, you should know that this is not entirely a sob story. From the ashes of one industry, another one has emerged quite triumphantly. 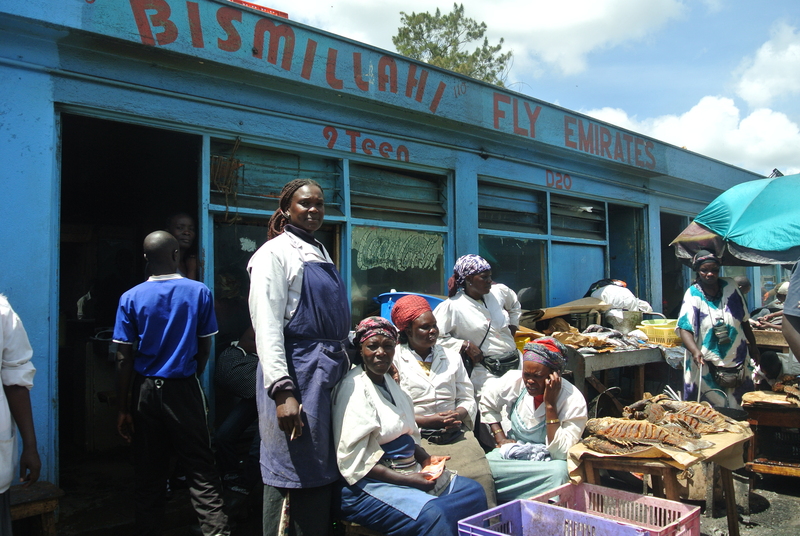 Mitumba is a bustling business sector in Kenya. It has created thousands of jobs where the government and private sector have failed to do so. Furthermore, the state cashes in on import revenues and so do local city-municipal councils that require all vendors to purchase trading licenses regularly. Mitumba is popular across the entire spectrum of Kenyan society. 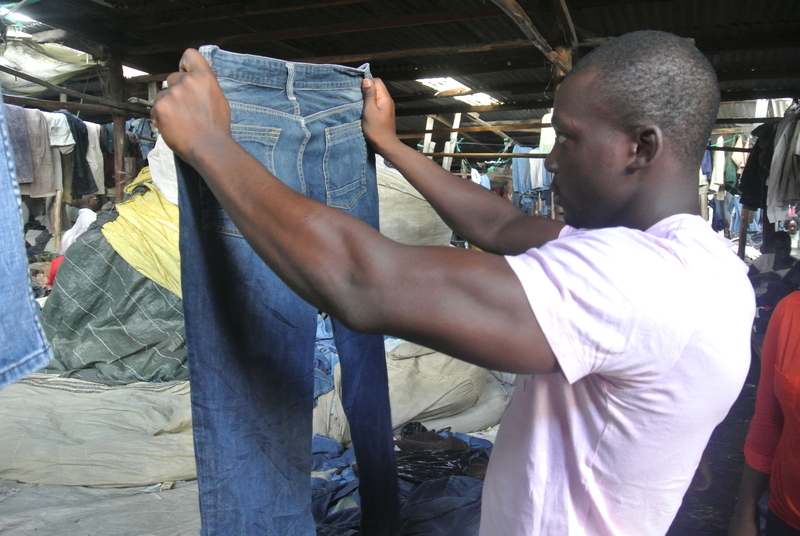 The poor could not afford to clothe themselves otherwise, while middle class and affluent Kenyans turn to Mitumba for designer labels and high quality, unique clothing intended for western markets. Western Charities: First, western charities sort through donations to add to their local thrift stock. Next, they sell the surplus to SHC dealers in order to generate funds for their programs and operations. 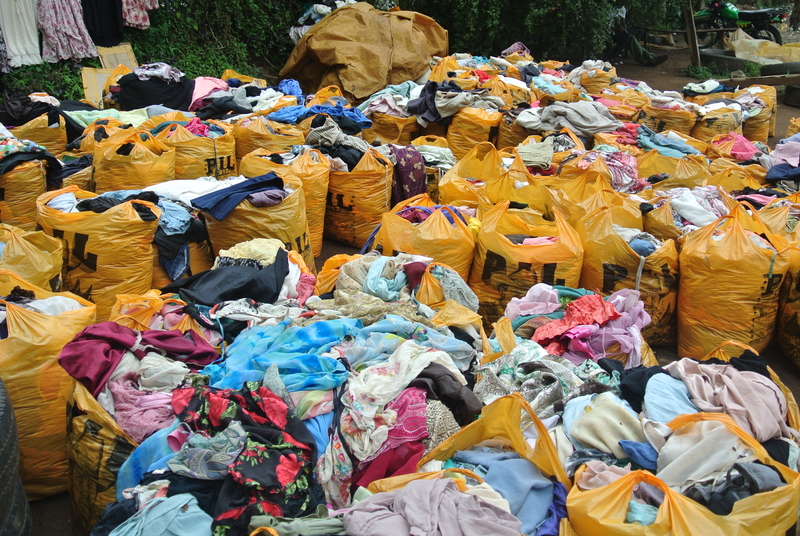 About 80% of donated clothing is usually sold to merchants. Exporters/Importer: The second hand clothing merchants sort the clothing by condition and category; good/poor quality, women’s/men’s/children’s, shirts/pants, etc. Then, they’re bundled in plastic packaging called bales and shipped to the major East African port city of Mombasa in large containers. The bales are purchased by the ton. When they arrive in Kenya, they are stored in warehouses, mostly around the port of entry. Wholesalers: Major wholesalers purchase bales in Mombasa and transport them by truck to Gikomba market in Nairobi, ground zero for the wholesale mitumba trade in Kenya. 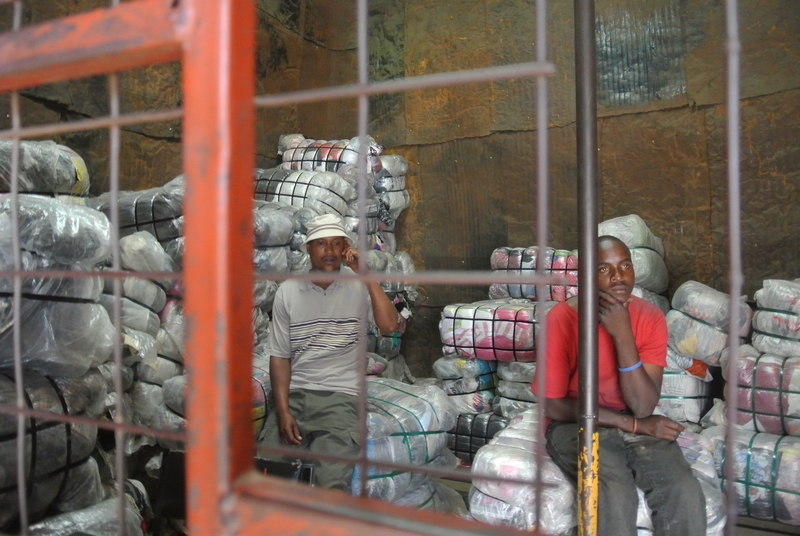 Next, medium wholesalers purchase the bales and sell the clothing to retail vendors who travel to Gikomba from all over the country to purchase stock for their businesses. 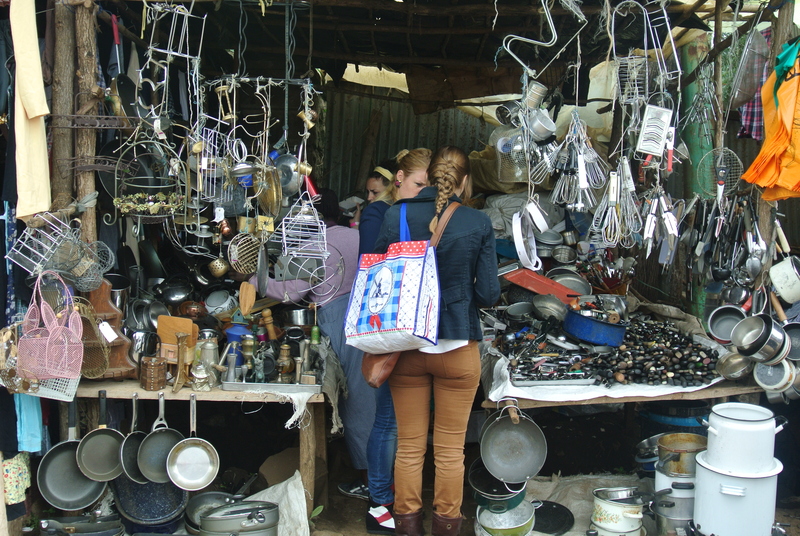 Retailers: Toi market, an offshoot of Kibera slums, is the largest retail market for used items in Nairobi. Other vendors fan out to cities and towns across the country. Hop on matatu #7 behind the National Archives in town for the short ride to Gikomba Market, Kenya’s hub for wholesale SHC sales. This is a thrift shop on steroids. Gikomba is a labyrinth of rickety wooden stalls, adorned with rows of garments hung like ornaments on a Christmas tree. Vendors, perched above colorful mounds of clothing, call out to customers, shouting prices from their stalls. Bales of clothing are hauled through its narrow, muddy corridors on sturdy backs and rickshaws, as customers bob and weave through the chaos looking for quality clothing at the lowest price. The sound of “camera, camera” fills the air. 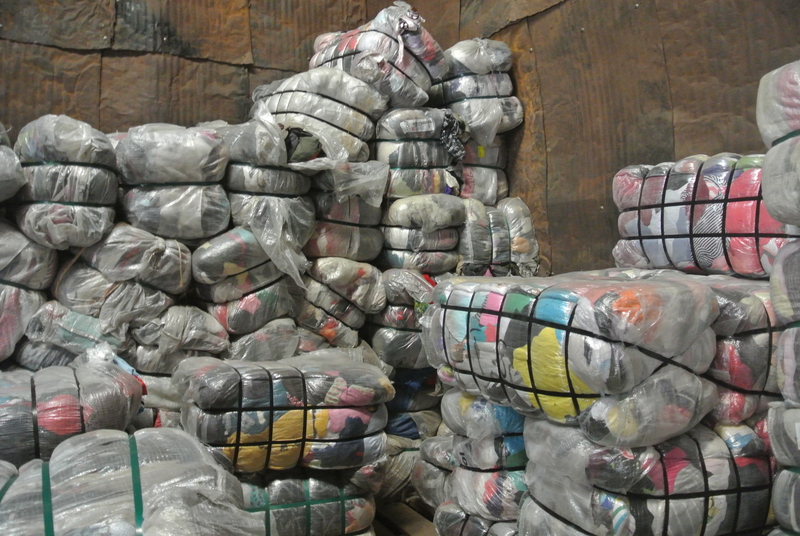 Clothing, both retail and wholesale, are sold in rounds by grade. Each round is called a camera, first camera, second camera and finally, the third. 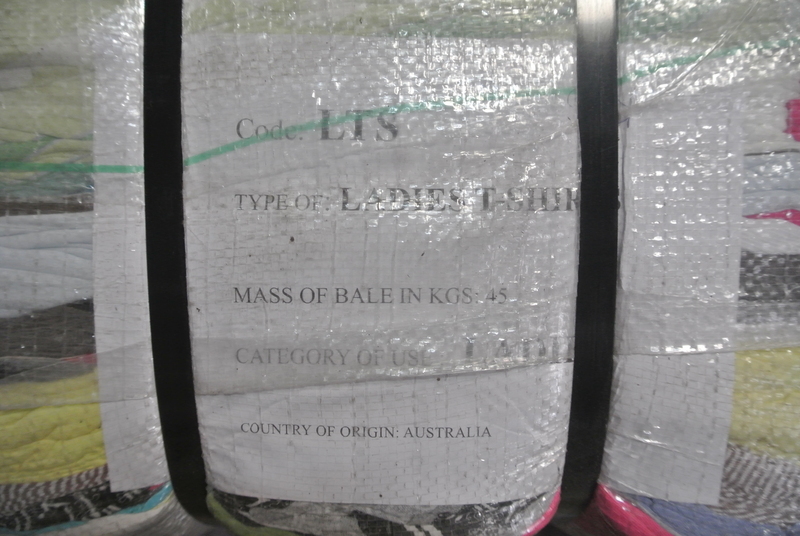 Once the bales are opened and sorted, the best quality clothes will be the first to go. Vendors often build relationships with each other in order to get first dibs on “first camera” clothing. 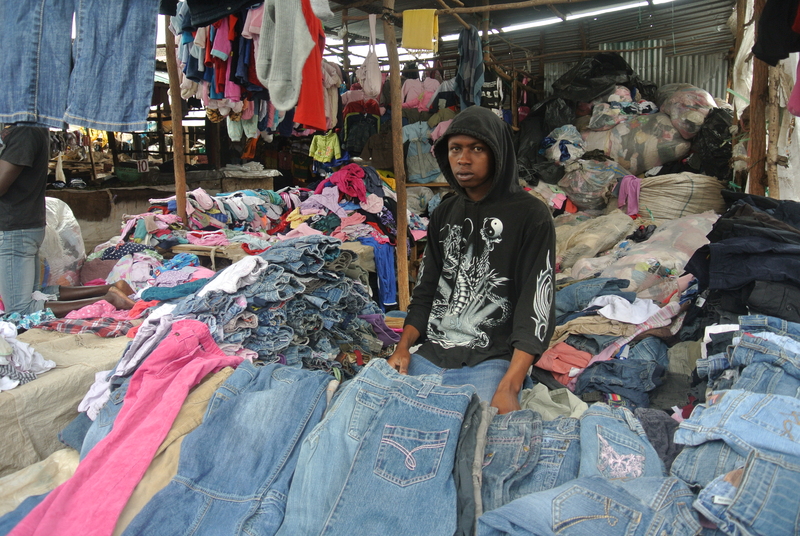 Francis, from the Kingara section of Nairobi, supervises a store that sells bales of clothing in the market. Drivers for the business go back and forth to Mombasa at least twice a week, bringing back about 70 bales of clothing with them each time. The drive from Nairobi to Mombasa is about 8 hours one way. According to Francis, a bale of 1st grade clothing can range anywhere from KHS 9000 (about $100) to KHS 14000 (about $200). 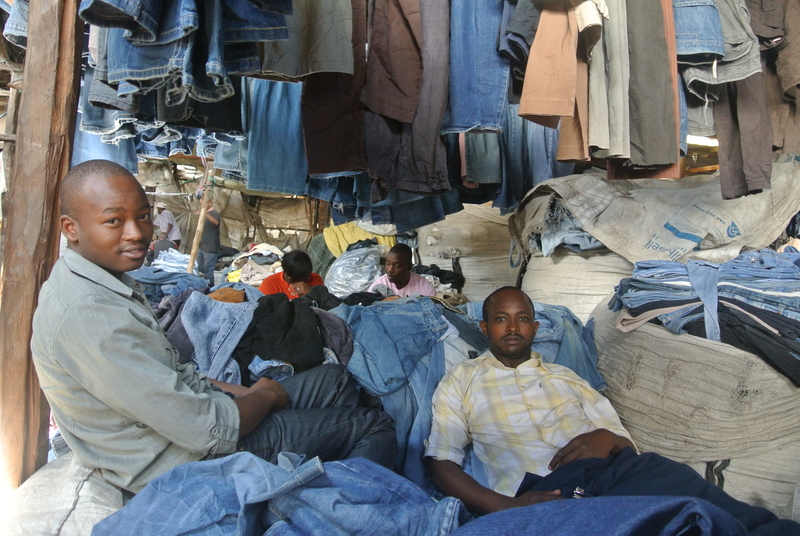 Thomas Wahome, 24, and Samuel Mwangi, 28, have both worked in Gikomba market for 3 years. They rent a stall for KHS 1500 (about $20) a month to sell men’s and women’s jeans. 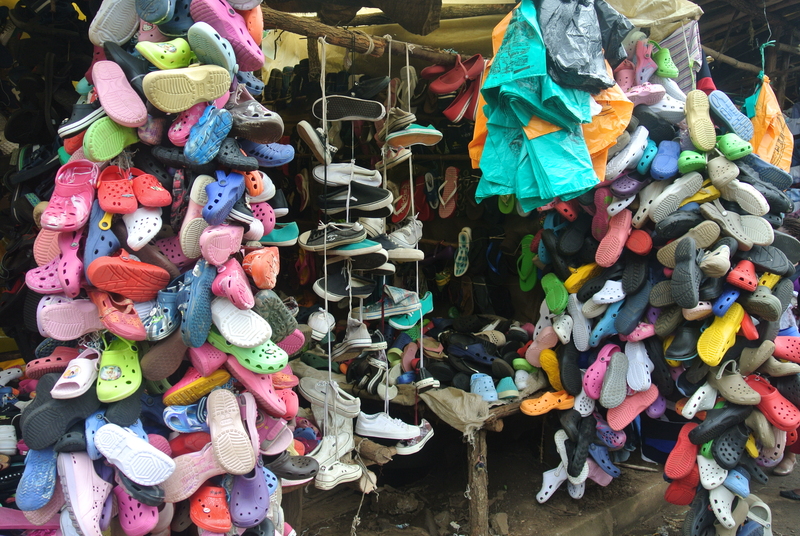 At their stall, the cheapest pair costs 100 shillings (about $1.50). Paula Bosire, an accounting student at Strathmore University, likes to mix and match her wardrobe. Some of her clothes are brand new from local chain stores and others are second hand. 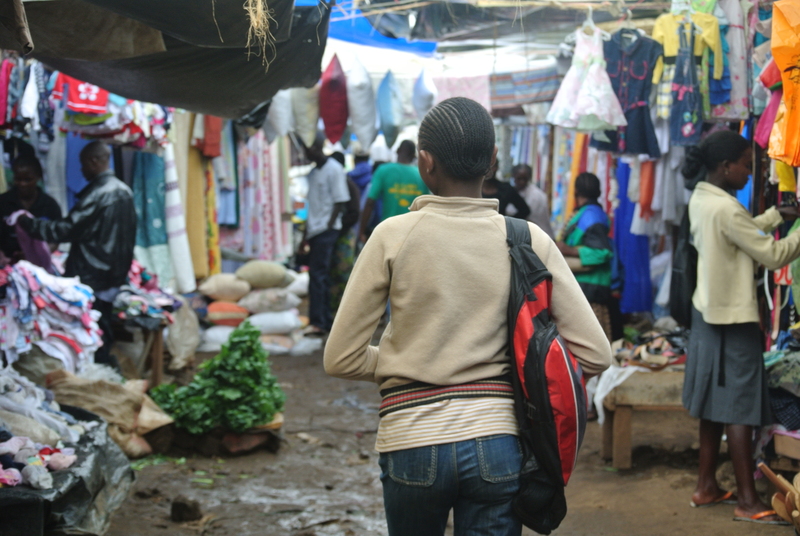 She is a frequent visitor to Gikomba, where she goes to find prices even cheaper than Toi’s. “I shop at Woolworth’s and Mr. Price for statement pieces and come to Gikomba for really good deals and things that are practically new. Sometimes the difference isn’t much,” she said. On this day, Paula left Gikomba with stylish scarves and a pair of slacks and jeans that cost KHS 40 (about $0.50) each. Geoffrey Messo, 24, is a mitumba retailer at Umoja, an estate in Nairobi. 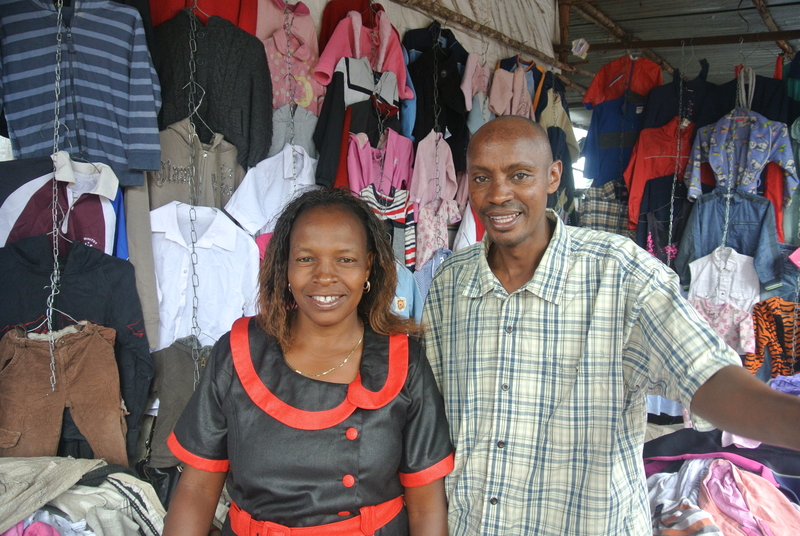 He has been in business for 8 months and visits Gikomba twice a week to purchase new stock. He retains customers by building relationships with them, getting to know their styles and taking personal requests for items. According to Geoffrey, starting off as a mitumba retailer is not difficult because it requires very little capital upfront. However, like any business mitumba is not devoid of challenges. Sometimes Geoffrey is stuck with clothing that doesn’t sell. 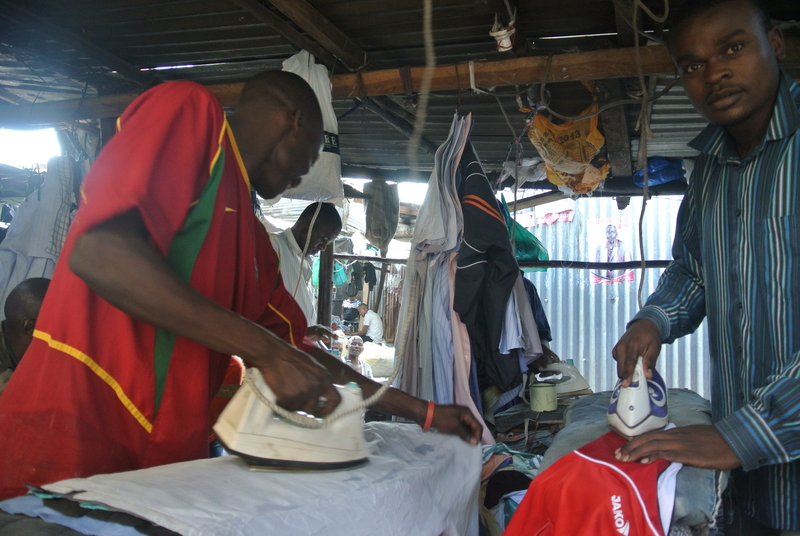 Gikomba market generates tons of spinoff employment. It’s like a city within a city. Security guards are hired to protect stalls and stock. There are tailors on site to repair clothing and stalls set up exclusively for ironing. Shoe cleaners wait at the exit of the market with brushes, soap and water to wash off the mud accumulated from a busy day of shopping, and food vendors are on site to fuel the spending. Naima, is known as ‘mathe’ in the market which means mother in shang, Kenyan slang. Originally from the coast province, she is the owner of ‘Real Madrid’ restaurant, located at the center of Gikomba’s hustle and bustle. She’s run her business in the market for 8 years. 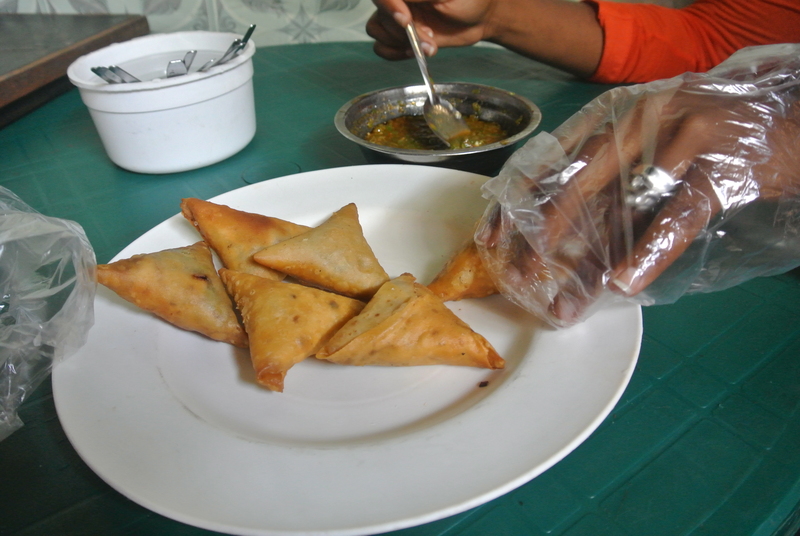 In addition to feeding hungry shoppers with typical Kenyan dishes like chapati, samosas and greengrams (lentils), she caters for parties and offices in the Westlands and Hurlingham sections of Nairobi. “People come from very far to pick clothes for their businesses. This is a meeting place for them. They sell, exchange, I let them do whatever they want [here]. They come in the morning, leave their things, I keep them safe while they go to buy. Then, they come to eat, talk with friends and return home, ”said Naima. A portrait of Gikomba market would not be complete without mentioning that it is also Nairobi’s wholesale fish market. 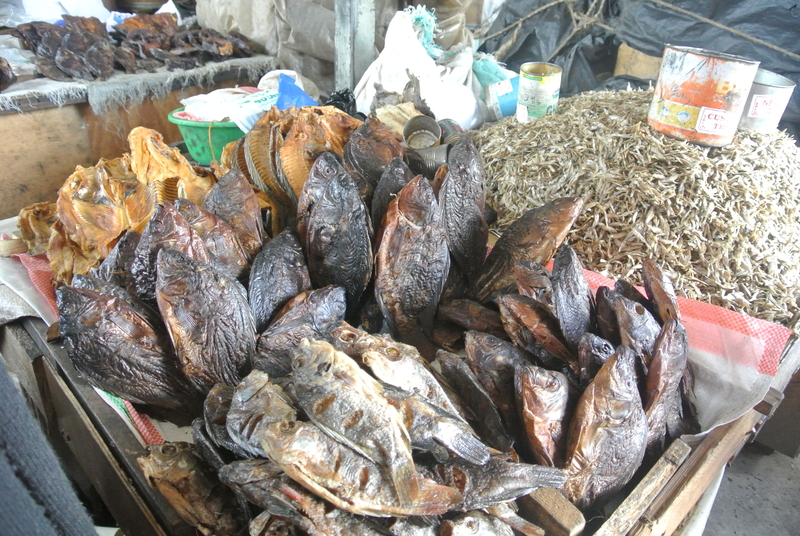 Hotels, restaurants, businesses and even individual shoppers flock here to purchase fresh and smoked fish from Lakes Victoria and Turkana. Geoffrey Messo, the clothing vendor who I met shopping for stock, introduced me to his mother Helen. She has been selling fish in Gikomba for 10 years. She sells fresh fish from Lake Victoria. She receives shipments of fish everyday. Along with most vendors in the market, she rents a space in communal refrigerators to store her supply. 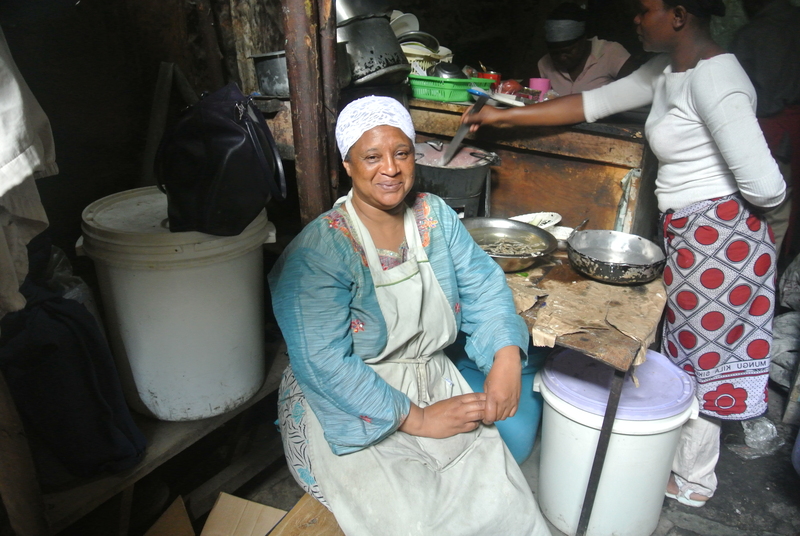 Her customers, many of whom are restaurant owners, come straight to her in Gikomba. She also makes home deliveries. 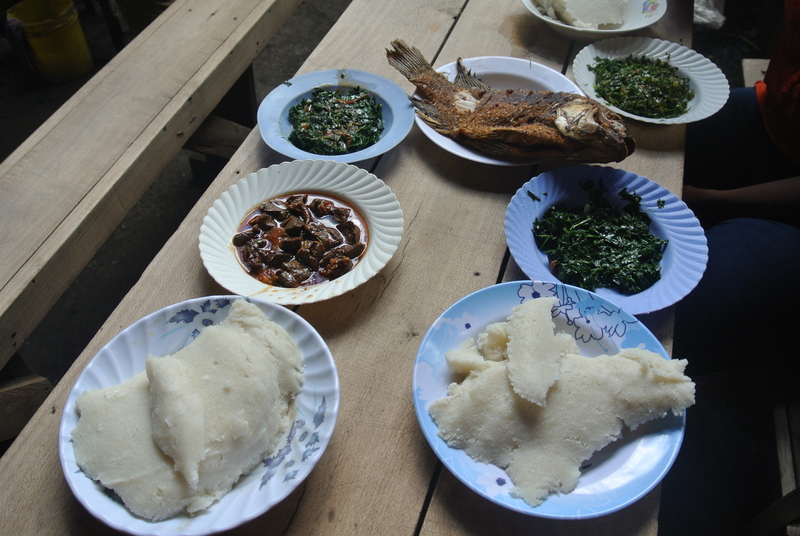 If you’re not in the mood for samosas or greengrams at Naima’s ‘Real Madrid,’ stop by the fish section of the market for freshly fried Nile perch, a side of sukuma wiki, kale, and the Kenyan staple ugali, corn flower cooked with water to a dough-like consistency. 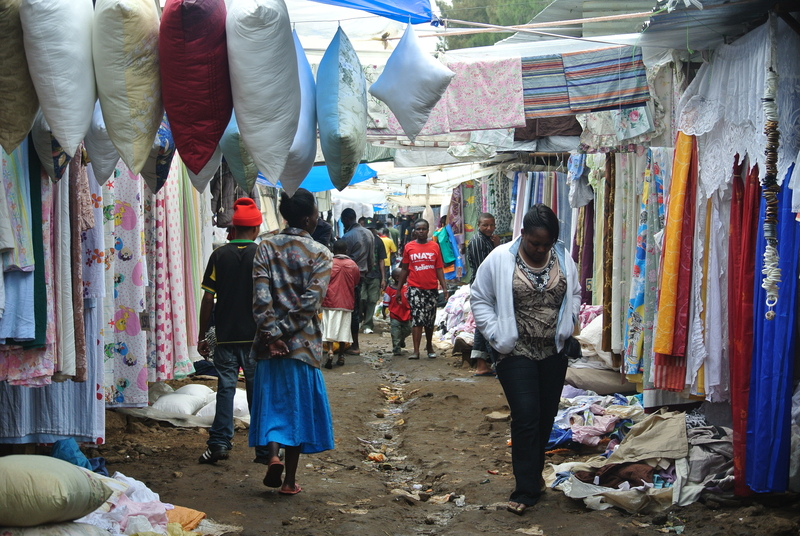 Toi market is located at the outskirts of Kibera slums in Nairobi. 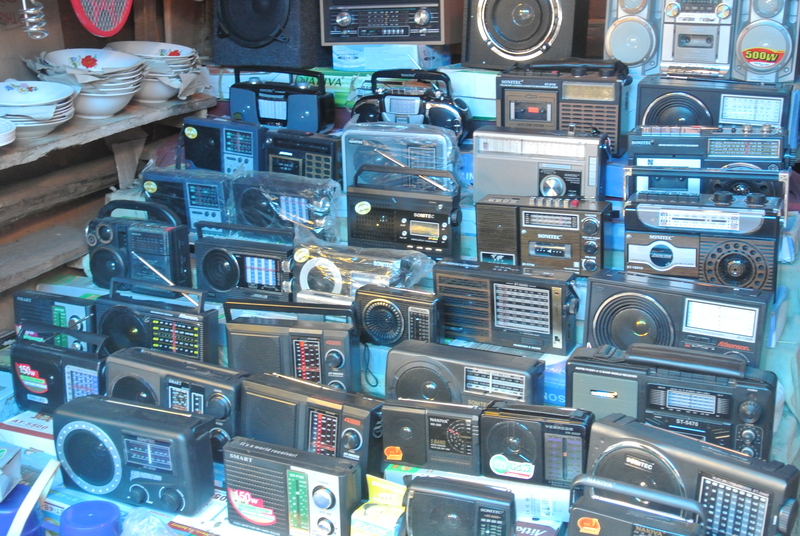 According to Citizen TV Kenya, ”the market, which started in 1992 as a food center, where people could stop for a bite to eat, has become a vast emporium of second hand shoes, shirts, bags, pants and dresses. “ Toi market is the primary retail-shopping destination for the average Nairobean. It’s less hectic, more spacious and secure than Gikomba market, which is located near the city center. Boniface started working in Toi in 2005. He has lived in the adjacent Kibera slums for 22 years. He was previously employed in the ‘jua kali’ sector making furniture, but left to go into business for himself. “ I wanted to be self-employed, to rely on myself and my own business, to live my own life, personally. The business is cheap to start,” said Boniface. Unlike most vendors in Toi who rent, Boniface owns his stall. He purchased it for KHS 25,000 (about $300). Jackline Arunga, 18, is a newbie in Toi. She has only worked in the market for 1 year, selling children’s clothes exclusively. 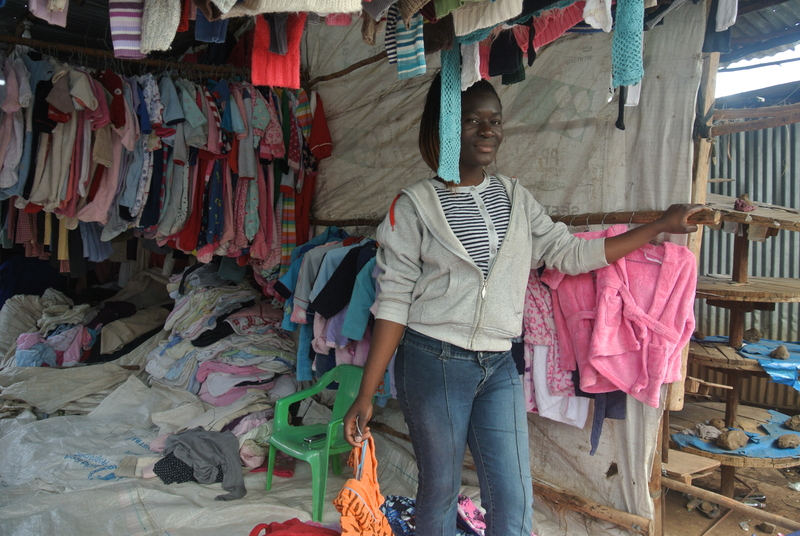 She rents her stall along the roadside for KHS 1500 ($20) a month. Once a month, she travels to Gikomba market to restock her supply of mitumba. Jackline’s long term goal is saving money to enroll in university. Brisbane John Ndavi owns a stall in Toi market with his wife. They have worked here for a decade. Like for many Kenyans, it is difficult to survive on one income alone. So, Brisbane has more than one job. He is a full time security guard at an international embassy in Nairobi. Brisbane and his wife sell mitumba from a great location on the roadside. The price of owning or renting along paths, well worn from foot traffic, is double that of stalls off the roadside, deeper inside the market. Brisbane sited land ownership discrepancies as one challenge to feeling secure in this line of work. Neighboring Kibera and Toi market are both informal settlements, and who exactly owns the land has been a huge point of contention for decades. There are constantly rumors about developers seeking to gain ownership and wipe out the market. According to Brisbane, many vendors work with the fear that one-day, they’ll show up to work and find their structures ransacked and torn down. Toi market is not just a hub for clothing. It is a central location for all kinds of used items. On any given day, it’s common to see customers, both affluent and poor, Kenyan and expatriate, combing through books, toys, electronics, utensils, accessories, furniture and other items. According to The Standard, Verah Aboga is one of the businesspersons who sells second-hand kitchenware. 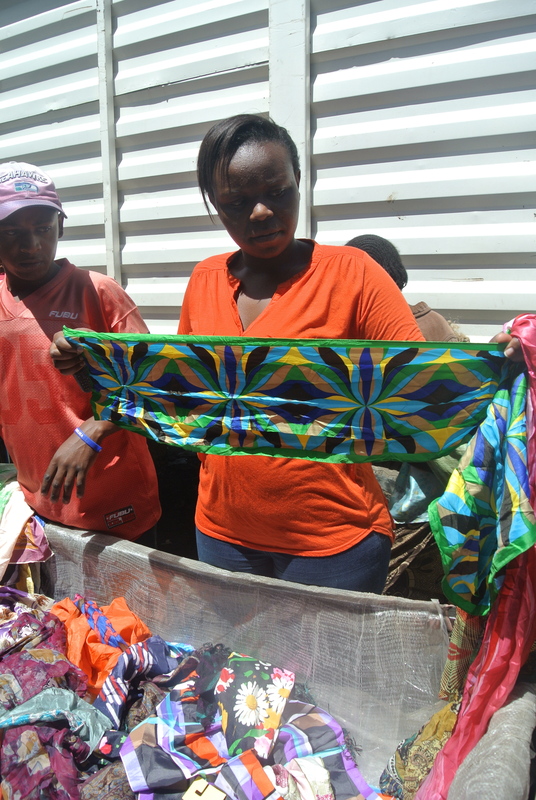 Aboga, who operates from Kitengela on the outskirts of Nairobi, sells the items on order to her customers in the city. Aboga noted that second-hand utensils are becoming popular because the market has been infiltrated by low-quality items. “Most of the sufurias (cooking pots) sold in the Kenyan market are very light and are not even made of stainless steel. This is what is making people switch to second-hand utensils, especially those who mind about quality,” she said. Market liberalization, coupled with the low purchasing power of the vast majority of Kenyans, has made the country fertile ground for the SHCT. It’s wildly popular across the entire societal spectrum. Nonetheless, there are several factors that could threaten the industry’s future in Kenya. 1) Cheap textiles from Asia are flooding the market. Although the competition from this onslaught is real, many Kenyans remain loyal to mitumba for its higher quality. 3) Local textile firms, that hope to stage a comeback, are lobbying the government to impose a levy on SHC shipments. They’d like the additional revenue to go towards a fund subsidizing cotton cultivation. Although government policies and the ever-shifting tide of international trade may ultimately have it in for mitumba, the view from the ground doesn’t hint at a demise any time soon. At an average of 90% off western retail prices, how can you go wrong? Shop on Kenya! I’ve been in Nairobi for just over two weeks (and more importantly three weekends!) and what has struck me most, beyond the friendliness of the people and the ever-present dust and diesel fumes, is the social scene and its social enterprise scenesters. 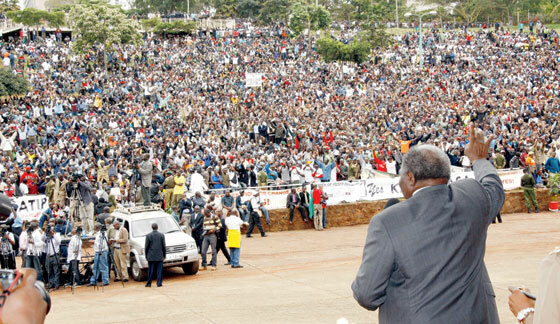 Kenya has undergone a transformation in recent years – the removal of long time president Daniel Moi in 2002 and subsequent democratic election of current president Mwai Kibaki was the start in a chain of events that has led to a resurgence in Kenya’s standing in the region. Recent Fellows’ blogs about Kenyans’ sense of hope (see Muskan’s “Trough” Blog) and the region’s innate entrepreneurial spirit (see Julie’s “How to Make it” Blog) demonstrate how these attributes, combined with political freedom and technological advances, have made Nairobi an emergent hub for development agencies and fledgling social enterprises alike. Shortly after arriving at my first Mexican microfinance organization, FRAC (or Fundación Realidad, soon to be called Vision Fund Mexico), I had the joyful task of presenting in the name of Kiva two Social Performance Badges to its enthusiastic staff: one for Vision Fund Mexico’s strong and persistent focus on poor people, and one for the organization’s success in empowering families and communities. The description of the Family and Community Empowerment Badge on Kiva’s homepage immediately piqued my interest: it states that recipients of this badge “implement innovative business practices and offer services in addition to their financial products to meet the needs of the people they serve.” Innovative business practices and additional services beyond financial products? At FRAC? I began to ask members of FRAC’s staff and was soon pointed to some great examples of non-financial services that Vision Fund Mexico has provided in past months and year: they include support in product marketing and distribution given to beekeepers and artisan villages, over 380 free financial literary workshops for well over 4,000 borrowers, and free expert veterinarian training and medical services provided to hundreds of borrowers who are raising cows and sheep in their backyard. While I hope that some of these topics will be addressed by future guest blog posts of FRAC staff members (continuing the series that was started by Rosa’s gorgeous post on her recent field visit), I will report here on FRAC’s selfless contribution to Mexico’s largest artisan fair, the Expo FONAES. In many ways, this is just another example to David Gorgani’s great piece on the wide range of non-financial services that Kiva field partner organizations provide. That strong sense of inspiration that speaks to me out of every Kiva borrower’s history has been multiplied during my time in the field as a Kiva Fellow in the course of many personal meetings with borrowers. I have met literally dozens of borrowers who have left an indelible mark in my heart and mind. But recently I have met a borrower who is so extraordinary and unusual that even I – one of the more seasoned Kiva Fellows – was blown away. Her name is Ma de los Angeles and this blog entry tells the story of her work and her success. Kiva is all about stories – what draws us all in and inspires us to lend are the stories of courageous micro-entrepreneurs that speak of hard-ship and success, challenges and dreams, love and dedication. But Kiva is not just about borrowers and their stories. It is also about the people behind the scene on the ground – the staff of the close to 150 field partners of Kiva – who screen loan applicants, grant, administrate, and look after Kiva loans, and make sure that Kiva borrowers are treated respectfully and fairly. Their stories are almost never told. Yet, the local staff of Kiva´s Field Partners are those people who make the magic happen – they are the ones who make Kiva possible. If Kiva Fellows are called the “eyes and ears in the field”, I propose local MFI staff be called “the brain and heart of Kiva.” MFI staff has insights on the conditions on the ground, the local mentalities, and the practical aspects of microfinance that can rival (and – I have no doubt – normally exceed) those of Kiva staff and Fellows. Yet, their perspective is seldom heard and their stories are rarely told. Just how much local field partner staff have to tell and to share with the world I learned during the brief three week period during which I had the pleasure to be the Kiva Fellow for FRAC or Fundación Realidad (soon to be known as Vision Fund Mexico) in Mexico City. FRAC, has over 200 employees – they encompass 200 breathtaking stories and lives from all over Mexico, coming together in FRAC’s vision of wanting to provide financial and non-financial services to those families who do not have access to formal banking services in order to improve their quality of life. During my work in FRAC’s Mexico City Headquarter, the MFI’s staff turned out to be an endless source of inspiration for me. There was not one person I talked to whose story and motives wouldn’t be worth sharing. Within a few brief hours I felt not just surrounded by close friends, but soul-mates – I discovered that everybody around me was at least as passionate and enthusiastic about FRAC’s and Kiva’s work and the impact of micro-finance as I am. As soon as I told FRAC’s staff about the Kiva Fellows Blog, I was bombarded with requests of staff members to publish their thoughts and their experiences on it. Many have a particular pet project they feel most passionate about; others have made an experience on the job they are keen to share. Thus grew the idea of creating a little guest blog within the Kiva Fellow Blog. I offered to all staff to publish their thoughts and words on the Fellows’ blog as a way to make readers aware that Kiva doesn’t just connect lenders with borrowers, but that it connects lenders with local staff with borrowers with friends with staff with borrowers with lenders with… stop! Let’s just say: Kiva connects people through lending! Rosa Gonzalez is the first staff member of FRAC who agreed to share her experience. She was hired by FRAC as their English-Spanish translator a few days after I joined the organization as a Kiva Fellow. Rosa translates both borrower profiles and journals for FRAC borrowers before they are being published or sent to lenders. But let me introduce Rosa in her own words – you will immediately see that they are pure poetry. I didn’t know what to expect, Honduras being one of the most dangerous countries in the world. After a couple of hours heading south with an entire family in the back of a pick-up Toyota, I arrived in Danli in southern Honduras late at night.